What are you doing at SARM? I’m a full-time assistant engineer. I really like that I’m guaranteed an income. The work hours aren’t necessarily 40 hours a week, though. It’s often closer to 80 (laughs). When did you start working there? Right after I finished the course, and I’ve been there for a year. Did you go right into full-time work? No. After the course, I started sending out emails everywhere. I ended up getting a work experience placement at SARM. I stayed there for a month. After that month was over I asked if they had a new work experience person coming in. They didn’t, so I stayed longer. Eventually they asked if I wanted a job. Of course I said yes! I guess so. I used those months to do all the little things that make people miss you if you’re not there. Really simple things like filling up the little pots of coffee, tea, and sugar. Or cleaning the kitchen. If you’re not there, then it doesn’t get done. It’s really just noticing these little things…common sense, most of it. We had Jerry Barnes and Ralph Rolle from the CHIC organization here recently. I think they both said you have to be very humble in this industry. You’re saying it’s common sense…but clearly by doing those little things you made a good impression. I guess so. I hope so! Have you had the opportunity to step into the engineer role at all? Oh yes, quite a bit. The first few times I thought “Ah! What am I going to do? !” It was fine. You make mistakes, but you also learn very, very quickly when you mess up in front of your clients (laughs). Your first engineering session was at Trevor Horn’s personal home studio?! Yes. His usual engineer briefed me on the equipment, but I wasn’t getting any signal. Trevor was waiting for everything to be ready. In a situation like that, you need to just keep up the appearance that you know what you’re doing. But you do know what you’re doing, you just don’t know it yet. Often the situation works out just fine, and then you get asked to work again. It’s the “fake it until you make it” thing. I remember sending an email to Carlos right after that session to thank him. Without him, and his skills, and everything I learned at Abbey Road Institute I really wouldn’t have been able to do it. I was honestly really grateful. Carlos mentally prepared us for this kind of thing. You get put under pressure during the course, but it’s good to have that pressure. You learn to work under pressure. Would you say it’s the same kind of pressure as what you face in the job? Obviously, no one is going to watch you do a Pro Tools exam in a recording studio. As a student, we had deadlines; three hours to get something done and if you’re one minute late… that’s it! In the real world, people can probably wait one minute past the deadline (laughs). I do think you can get closer to the real world when you’re at a school like Abbey Road Institute, because it’s a private school. There are no extra requirements like having to write essays. What’s the point of an essay when you’re working in a studio? At the Institute, everything had a point. Was there any part of the curriculum in particular you enjoyed the most? I loved the focus on mixing. I also loved the electronics course. It was probably one of my favourite things. It came in handy because I’ve just been making cables for the studio. That’s what I did during work experience as well. It’s such a simple thing, but people would say “Oh, look at the new work experience girl, she’s making cables”. Did someone ask you to make the cables? I just asked one of the technicians if I could do anything to help. He said he had a “crappy” cabling job to do. None of the other assistants knew how to make a cable. Do you have a favourite or most memorable session at SARM you can share? I just love working with really cool people. 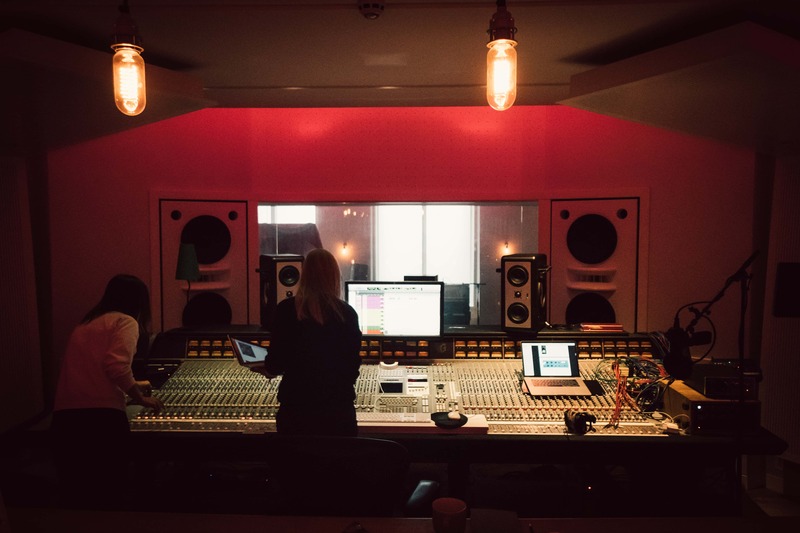 Working with Jeff Bhasker (Kanye West, Jay-Z, Mark Ronson) was a really big one for me. It was another “deep end” session. It was a fully analogue writing session, working with Mellotrons and all kinds of synths and drum machines. It was basically a long jam session; three days! It was off the back of another session at SARM where I met him as an assistant engineer, and a few weeks later he decided to come back to SARM and he asked me to engineer. Recently there was another session with a UK pop/grime artist who’s really coming up. He asked me if I produced, and if he could hear some of my stuff. I played him some of the tracks I made and he ended up writing a melody and lyrics over one of my beats. That was really cool. He’s really excited about it, so I’m hoping that it’s going to be released. That just happened last week. You never know what’s going to happen on any given day! So you produce as well? I do, and I want to go more towards that side of things. I really enjoy vocal production as well. I didn’t even know it was a thing! I really like getting a performance out of an artist and making it sound as good as it can. It’s probably my favourite thing to do. It’s more than just straightforward engineering, because it’s so much more personal. It’s almost like a therapy session for the artist (laughs). Ready go full-time working in a studio? Check out our Advanced Diploma in Music Production and Sound Engineering or contact us for more information.